directly on your trading account! Instant spread rebate up to 90% with over 50 most reliable, secure and world-renowned brokers. Get cashback while trading Forex for each transaction you make! Earn over $35 from every lot traded! No risk at all! All transactions are transparent and processed instantly. Get your cashback in terms of seconds! Receive automatic payments and withdraw your funds within 24 hours through the most popular payment systems. We offer you a live unbiased broker rating, so that you could select a 100% reliable broker with great execution speed and regular payments. FxCash is the first spread rebate service ever, operating since 2009. With a flawless track record, we managed making our service speedy, intelligent and reliable. Get spread rebate quickly and for free! Create your FxCash account by filling out a simple form. This is free! Open a trading account with any of 50 brokers through your member area or FxCash website. 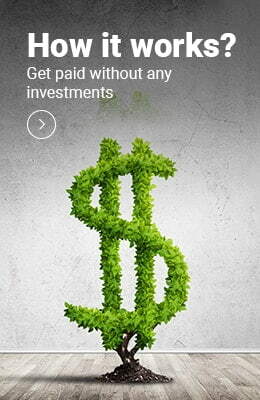 Get stable income from each trade you make with no additional investments. Get up to $48 for each trade you make. 200$ no deposit bonus for FxCash clients!